A couple kissing in front of Macy’s in Herald Square is hardly newsworthy, but one at last year’s Thanksgiving Day Parade actually marked a milestone in live TV – and was also a spoiler for a Broadway musical. Televised by NBC, “It’s Time to Dance,” the finalé number from “The Prom,” ended with two young women sharing a loving kiss. So now you know how “The Prom” resolves. 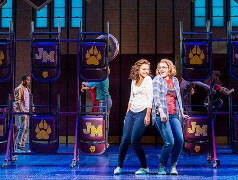 But any audience member who doubts that Indiana high schoolers Emma (Caitlin Kinnunen) and Alyssa (Isabelle McCalla) will end up together, are as heartless as the PTA folks who cancelled the prom because Emma wanted to bring Alyssa as her date. If that sounds like a serious topic, it is. 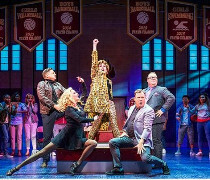 But woven into the fabric of “The Prom,” it is the raison d’etre for the most upbeat, romantic and downright funny Broadway Musical in years. The book, by Bob Martin (“Drowsy Chaperone”) and Chad Beguelin (“Disney’s Aladdin”), who also wrote the lyrics, proceeds along two tracks that function individually even as they complement each other. 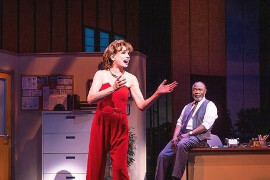 The Broadway track, we’ll call it, is rich with show-biz references and more than a hint – okay, a blast – of camp, while the Indiana track is heartfelt, with a relevant object lesson at its core. When you are not laughing at the one ‘track,’ you are welling up with empathy for the other, and their eventual merger – in captivating story, scrumptious song and exhilarating dance – is a collaborative triumph among the aforementioned authors, with composer Matthew Sklar and choreographer/director Casey Nicholaw. Christopher Sieber plays Trent Oliver, whose “Godspell” tour hasbeen cancelled, leaving the stage-weary veteran of four Jesus roles free to start a Theater Arts class in the high school. If his inspirational, rousing “Love Thy Neighbor” is any indication, he’ll be turning out budding superstars. And while we’re talkin’ superstars, consider Ms. Kinnunen. Her Emma is the most endearing young woman in this symbolically stigmatized Indiana town – and, in fact, anywhere else where acceptance of diversity is in short supply. Emma tempers her anxiety with intelligence and wit (“Memo to self: Don’t be gay in Indiana”), and her song “(I Just Wanna) Dance with You,” sung to (and later with) Alyssa, is beyond lovely. The youthful ensemble gets a workout from Nicholaw’s spirited choreography. The Indiana teens may have their hang-ups about sexual orientation, but they sure can dance. That closing number, “It’s Time to Dance,” and the smooch you hoped for (and knew would happen), sends you out of the theater on a very special Broadway Musical high. Don’t wait until someone else asks her/him/they/hir/zim. Get yourself a date and go to “The Prom.” Longacre Theatre, 220 West 48 th Street, NYC. ForTues-Sun. Performance schedule and tickets: Telecharge.com or 212-239-6200.